Eco Waterway Services uses SRS Crisafulli’s new shallow draft dredge, the Rotomite SD110. This enables our specialists to dredge in small, shallow, confined areas in a minimum of 17 inches of water. This compact, self-propelled, steerable machine can dredge just about anywhere without the use of cumbersome cabling. The SD110 is made entirely of aluminum, and is equipped with a hydraulic ram that puts a great amount of pressure on condensed materials that may otherwise be hard to remove. 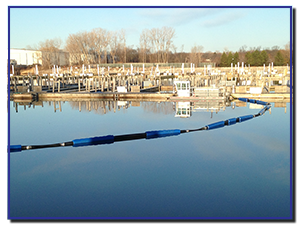 Designed specifically for marinas, boat slips, bays, and other confined areas, the SD110 can pump dredged sludge and slurries over substantial distances to remote disposal sites. It’s propelled by a 40HP outboard engine and its 110 horsepower diesel engine that powers the pump and auger can process 85 cubic yards of sludge solids per hour. 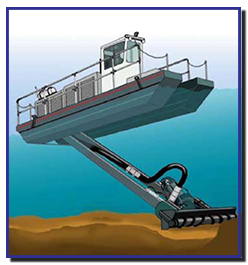 Our equipment can dredge up two 12ft deep and our dual power systems achieve quiet and economic operations for propulsion or traverse dredging. The Rotomite SD-110 comes standard with a traverse system to allow for dredge to be run on a cable system where precision is crucial, you also have the freedom to dredge where you want with the maneuverability of the propulsion system. The Rotomite SD110 gives us the ability to remove sediment in just about any environment. Eco-friendly with no impact on the shoreline. The entire process is solely water based and does not need additional heavy equipment on your property. Sediment is removed through a high pressure hose system either directly onto land or into a mobile belt filter press that dries the sediment before removal. This means that only the sediment is removed from the location and the water stays.